Alongside the rest of the team, she’s spent recent weeks harvesting a healthy crop of rhubarb and preparing for the summer growing season ahead. “It’s really good, I really enjoy it,” she said. 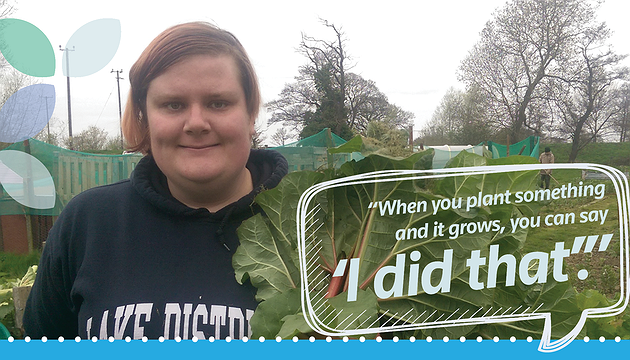 “I think my favourite job is the strimming, but I like planting stuff as well. Heather, who has Asperger syndrome, said working there had helped to make her more physically active and meet new people. She lives locally and is able to walk to the farm every Friday to take part in activities there. She hopes to pick up some part time work as a result. “I like outside stuff,” Heather said. “It’s structured, and there’s always something to do. “I’ve met new people and made some new friends, and I’ve learned a lot. Being outside helps, and helps how you feel too. Seeds2Grow provides accredited training and activities in horticulture to individuals who face complex barriers to employment and have substance misuse, mental health or other work-limiting health condiitons. Participants from Conwy, Denbighshire and Gwynedd will gain new skills and increased confidence in moving closer to becoming economically active. Seeds2Grow provides accredited training and activities in horticulture for those who are long-term unemployed or who have work-limiting health conditions.